Nestled in the foothills of southeastern Washington's Blue Mountains, Walla Walla has been a center of commerce and culture since its founding in 1862. Earlier, the Walla Walla River Valley was the site of Indian rendezvous, Marcus and Narcissa Whitman's mission, and British and American forts and trading posts. The new city prospered as an outfitting center for nearby Idaho goldfields. Capt. John Mullan's military road provided a route for miners and new settlers coming to the valley. Merchants like the Schwabacher Brothers and bankers Dorsey Syng Baker and John Boyer tapped into the city's growth, which expanded as wheat became the new gold. Home to Fort Walla Walla, the city welcomed Whitman College, Walla Walla University, and the territorial penitentiary. Today, the revitalized downtown and burgeoning culinary and arts scene are popular tourist destinations. Walla Walla sweet onions are nationally known, and more than 120 wineries call the valley home, from Figgins family's pioneer Leonetti Cellar (1977) to football legend Drew Bledsoe's Doubleback winery. 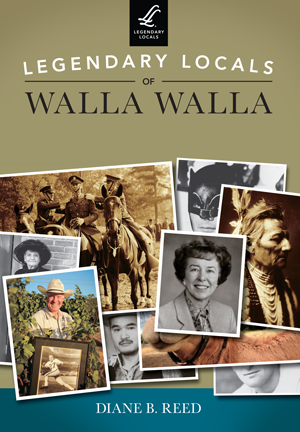 Historian, author, and photographer Diane B. Reed introduces noteworthy inhabitants of the Walla Walla Valley including Chief Peo-Peo-Mox-Mox, Suzanne Cayuse Dauphin, William O. Douglas, Raymond Borleske, Gen. Jonathan M. Wainright, and Jeannette Hayner. Reed blogs about the Walla Walla Valley, and her stories are featured in Walla Walla Lifestyles magazine.